Most EGS guitar orders are for stainless frets, which, if you’ve ever worked with them, take a lot of effort to work with. Accurate seating of the frets makes for less leveling work, which in turns leads to less re-crowning work and saves lots of time. I have always hammered my frets in, which doesn’t always meet the above criteria, so I wanted to try pressing in the frets. Conventional presses (read Stewart-MacDonald) come with brass inserts for set radii. But with a compound radius fingerboard, or a multiscale fingerboard, there is a lot of variation of the radii across the fretboard. 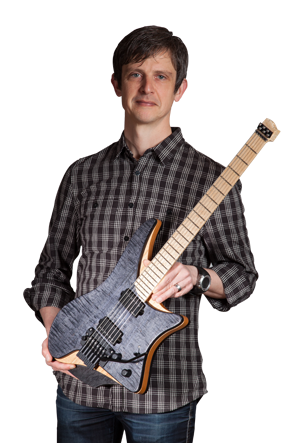 Additionally, the StewMac inserts are only 63.5 mm (2 1/2″) with isn’t enough for even a 7-string multiscale fingerboard. 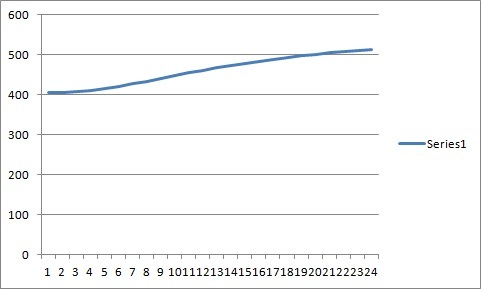 As you can see, the increase in radius between each fret is not linear, but less at the first frets and the last frets, due to the angles of the frets. The idea of making the press insert out of a flexible material and adjustable had been brewing for a while, and here is the first prototype. The insert is made out of PEEK, which is very strong, while still flexible. Glue squeeze out doesn’t stick to it, as an added benefit. The adjustment range is from 12″ to approximately 25″ and easily accomplished by turning the handle. I am planning on adding a counterweight to make the press itself balance. It has a 43mm mount, which is the same as most electric hand drill machine stands. I put my scales in the one pictured above and could easily accomplish 40 kg of pressure without the stand budging, and this was more than enough to press frets. I made this for my workshop, but will be happy to have a batch made. Manufacturing cost is highly dependent on the number of units (i.e. the prototype you see was _very_ expensive). Let me know if you are interested, and if we get enough volume, it might be almost affordable. 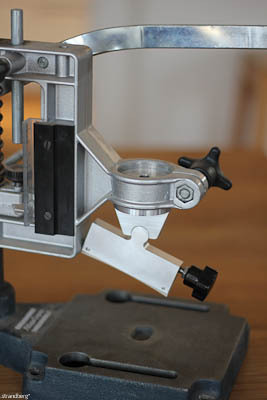 For reference, the StewMac Jaws fret pressing system costs $240, and the complete arbor press system costs $165. This will cost more for sure, just to set expectations. I am in let me know where to sign up. I love this idea but could it be made to have a tighter radius for tight compound radii? I would buy one but for now I’ll have to figure out how to make my own. Man, if this could go from about 7″ to 12″ or 16″ I would buy one in an instant. 12″ is usually about the flattest radius i ever use. Good stuff as is. 7″ to 17″ radii… Sweet!